EMILY DICKINSON . . . IN . . MY MOST HARD-CORE, CONTRARIAN, INDIE, REBEL, STUBBORN . . PROTEST-ANT / HEART. I REACHED OUT, . . . “BUT THE WORLD DID NOT REACH BACK”. It seems to be the season of recognizing – in capital letters, the female outsider geniuses that walked so unassumingly, but stubbornly among us. though, what a contrast: EMILY DICKINSON vs FLORINE STETTHEIMER. about the most they have in common, beyond sharing a stubborn faith in their own forward-reaching, somehow . . ‘future’ vision, & a singular, uncharted creative .. drive. was that they both lived at home for their entire lives, and were generally unrecognized in their own times. though of course, EMILY DICKINSON (1830-1886) predated FLORINE STETTHEIMER (1871-1944) by a 50 year birth gap, which is such a small generational number in the greater picture, yet seems so far apart seen through the lens / bedrooms / living rooms . . . of their individual life-styles. Emily D. lived through the Civil war / Florine S: through WWI & WWII. while one – Emily D. was a ‘poet /artist’ . . the other – Florine S. was an ‘artist/painter/poet’. though not internationally ‘cosmopolitan’ in the lavish & wealthy sense that we associate with Florine Stettheimer . . Emily D. did not live in a remote cabin, though she worked from her bedroom. and is generally considered a ‘recluse’. in fact, Emily D. lived within the vibrant society of a ‘college town’, her grandfather having co-founded Amherst College. and she read many leading magazines etc. and she had to deal with . . scandal !! major scandal. her married bro & his mistress. some little buzzing garden that was. you don’t hear that about Florine’s family !! though you kind of wonder: what really went on with Florine S. and her sisters, behind closed doors – besides high-end couture, with lots of shopping trips to Bendels !! not too much is revealed on the record, except for some unhappy poems . . Florine was to pen / about scaring away suitors with her bright ‘light’. so, it’s kind of shocking to find that Emily D. was one step away from her sibling’s full-blown, torrid love triangle, that if it had been 19th Bloomsbury . . might have touched and rocked her world, as well. lucky for us, both had their works, Emily D. her poems, collage poems & hand-stitched ‘booklets’ / Florine S. her artworks, poems, plays, stage sets, etc preserved for us, by immediate family members, who also went on to donate the bulk of these precious estates to museums & libraries. so, they were recognized within their own circles – well, that’s about the best you can hope for, as an ‘outsider’ – isn’t it ? but mostly, what’s most compelling about both them, these American ‘soul sisters’ – is that their inner worlds propelled . . both of them forward, so far forward / that flash forward 2017: both Emily D. and Florine S. . . are subjects of newly rapt acclaim & . . solo museum shows. Emily D. at the Morgan Library Museum, while Florine S. is concurrently, beautifully presented at the JEWISH MUSEUM – thru Sept 24, 2017. 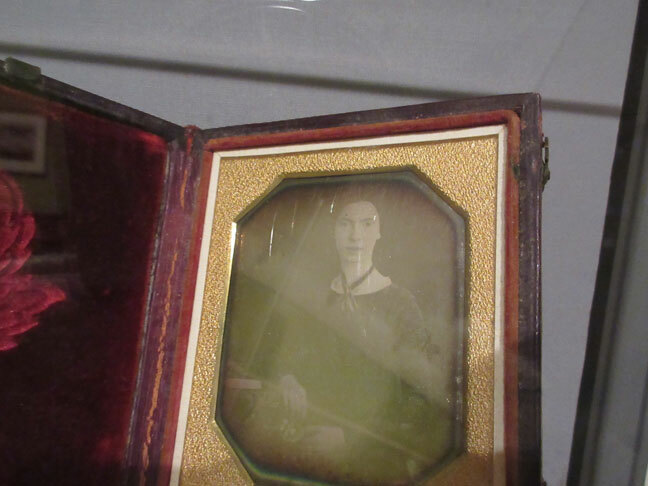 EMILY DICKINSON, Daguerrotype, ca. 1847. 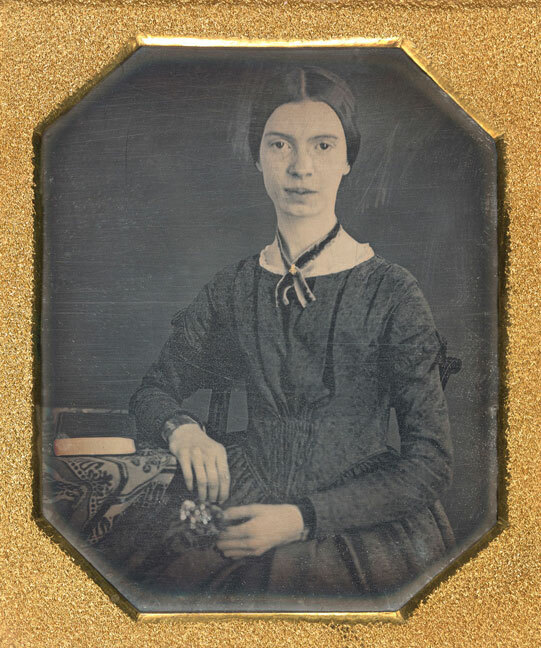 The Emily Dickinson Collection, Amherst College Archives & Special collections. gift of Millicent Todd Bingham, 1956.
which also has a very good online presentation on the exhibit . . .
and also, the very best cafe food – of all the museums & libraries in NYC – by the way. though strangely enough, the JEWISH MUSEUM is a very close second, with their authentic Russ & Daughters’ bagels & buttery lox / smoked salmon !! I have to admit, I knew more about Florine Stettheimer, from living in avant-garde NYC all these years, there were some previous exhibits associated with her, or her circle / than I did about Emily Dickinson – esp being Canadian & thus under-educated in general re American culture. I had a big catching up to do, and maybe that’s what fascinated me. At any rate, young Emily D. looks just like someone I went to high school with, and even more, she looks she could just step out off the L train, albeit in different garb. my heart sunk to see her so young & earnest, and to later be so beat down by a repressive culture. though what else is new for outsiders, anyway ? even the fabulous Florine, wanted her artwork destroyed upon her death, due to cultural disappointment, to put it politely. EMILY DICKINSON (1830-1886), ‘A Pang is more conspicuous in Spring’. Poem, ca. 1881. / Amherst College Archives & Special Collections. when I saw this ‘shaped’ poem I got it right way, and so will you – why they call Emily Dickinson, . . a poet – artist. she wrote her poems out in teeny tiny handwritten script, something of which we might be much more curious about today – despite or actually because of . . computers !! which has ironically resulted in our endless fascination with all things . . graphic design & fonts, but esp DIY hand-script !! 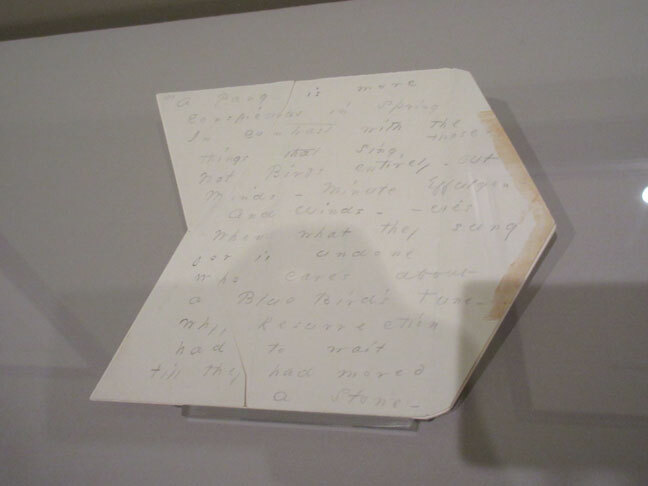 apparently, she also wrote on all kinds of different papers, (texture-wise, etc) not just oddly shaped ones, and left-overs from envelopes, etc. the effect of which is hard to translate through written language, let alone limited old fashioned typeface / and is much easier to convey today – with our easily accessible, modern means of photographic reproduction. though I was super disappointed upon reading, in the exhibit texts, about her use of ‘fascicles’ or hand-sewn manuscript booklets, not to find any here. not even a photograph ? I guess they are too fragile to travel, but what about an archival photograph ? EMILY DICKINSON, (1830-1886), ‘Alone and in a Circumstance’. Poem with “George Sand” and “Mauprat” clipped from Harper’s Monthly pasted to sheet, ca. 1870. “This collage is one of Dickinson’s most enigmatic manuscripts. 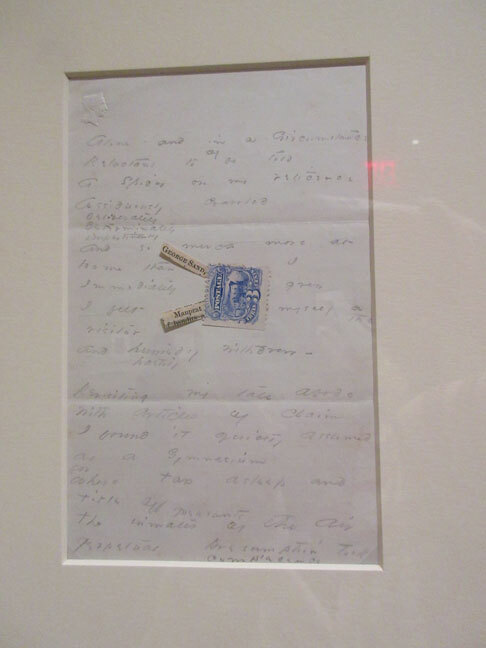 The two clippings tucked under the postage stamp were cut from the May 1870 issue of Harper’s Monthly Magazine, which included a brief sketch of George Sand (!!). ps: May 1870 !! – that’s like 147 years ago – almost to the day !! a whole century – and . . a half. pss: if you came to my workroom / bedroom – you’d see my journals are full of the same kind of tiny stamp collages, maybe I’ll post one or two, next – just to show you how contemporary / out of the box – she was. 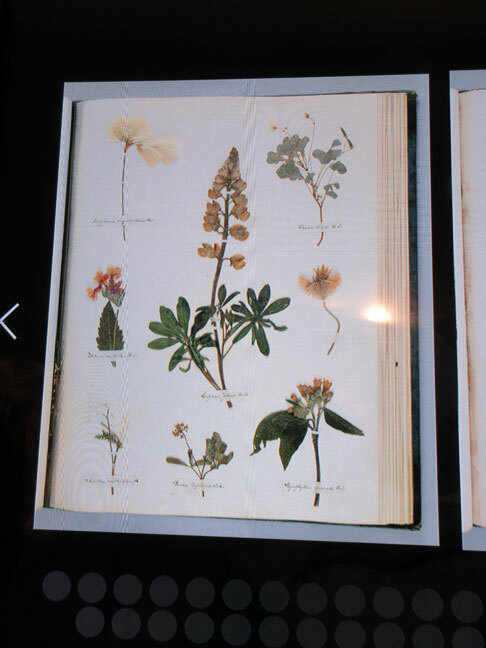 EMILY DICKINSON, digitized slideshow of her ‘Herbarium’, an album of pressed botanical specimens – which she began compiling ca 1839, when she was about 8 or 9 years old. I found it interesting how literary and scientific her family was, and that seemingly, she and her sister, or even mother did no handiwork ? no embroidered samplers ? no hand-crocheted collar lace / or shawls ? MABEL LOOMIS TODD (1856-1932), ‘Indian Pipes’. of course, I was totally blown-away by the love triangle, illicit p-a-s-s-i-o-n (!!) repressed, self-righteous Emily’s brother – Austin dropped on the family. esp because his wife, Susan was Emily’s best friend, and his 20-something years younger mistress, Mabel Loomis Todd, seems to have been quite enamored with Emily, herself, and/or her talent, at the very least. It was she, and not Susan, who ultimately played an important role in getting Emily’s work published !! I believe ‘Indian Pipes’ must be a kind of American wild flower ? black & white . . drama queen / DRAMATIC !!!!!!! 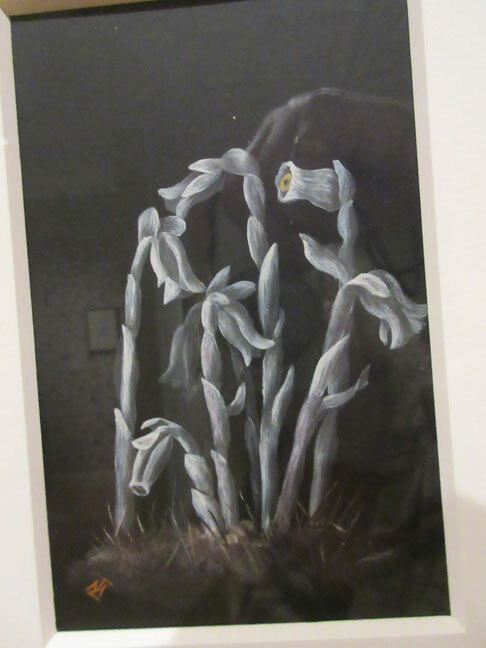 “Todd sent this painting of Indian pipes to Emily Dickinson in late summer 1882 while Todd was staying in Washington, DC. . . .
so, just how did Emily D. and the mistress . . interact, if only we had got that part of the story, too. life was so complicated – even for that literary . . minimalist. Amherst, Bloomsbury . . not ?!!! I mean, there is not a peep of this, in the poems, right ? what about in her letters ? that would have been amazing, I bet they got destroyed pretty fast, if there were any – no matter what they said. but damn it, color me: C-U-R-I-O-U-S !!!!! EMILY DICKINSON vs. FLORINE STETTHEIMER ??? now, that’s a strange bird . . up against / another. and plenty of secrets – to go around ! !